The Visitation Sisters of Ghent were invited to establish a community in Caversham in 1902, principally to teach in St Anne’s School. Two cottages next door to the presbytery were bought, and the first two sisters moved in during September of that year. Over the next half-century the convent grew to house a community of eighteen sisters at its maximum number. From the 1970s on the community declined until the last two sisters left the convent in January 2005, to the deep regret of the whole parish. They left behind a legacy of prayer, service, and Christian witness. The convent building had a chapel, lovely community room with windows on three sides overlooking the extensive gardens, dining room, parlours, kitchen and ancillary rooms, twelve bedrooms, storerooms and large attic space. 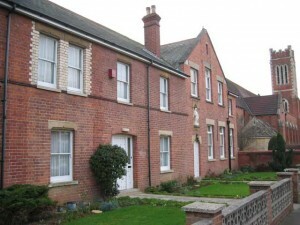 It shared the parish site with the church and presbytery, and St Anne’s primary school, so was at the centre of this large and active parish, although the convent and its gardens were the property of the Visitation Sisters and not part of the diocesan trust. Although the convent was only two minutes walk from the shopping centre of Caversham, and ten minutes walk from Reading railway station, South View Avenue is a quiet cul-de-sac; the River Thames with its riverside parkland is close by; and it is only a few minutes’ drive into the beautiful countryside of South Oxfordshire, the Chiltern Hills and the Berkshire Downs. Unfortunately, after the sisters had to leave the convent due to dwindling numbers, the building was not kept within the parish and was sold-off to become apartments.